Situated in the swanky 16th arrondissement in Paris, this home overlooks the genteel neighbourhood which features stately houses, art museums and leafy parks. Nestled in a Neo-Classical sandstone building distinctly from the Haussmann era, this apartment already had the makings of a dream home. 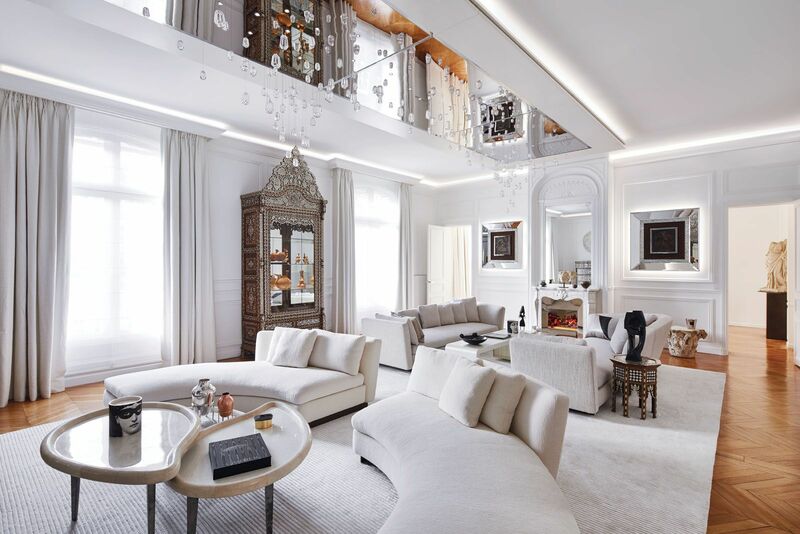 The owner wanted to enhance the lofty sense of space within the three-bedroom apartment with a white palette, while integrating the family’s antique cabinets, given to her by her father who is a specialist in Syrian antiquities. To create her dream home, the owner tasked Stéphanie Coutas of SC Editions. Coutas and her team started assembling various tactile textures in white to create a gallery-like yet multi-layered space that draws cues to the neighbourhood’s cultural heritage. “I wanted to give the sensation of walking around a museum—a sense of structure mixed with a cosy and comfortable environment,” she explains. Various carpets, furs, leathers and natural stone were thus selected to create a mix of matte, shiny and brushed finishes to form the perfect setting for the antique collection, before the team began designing a complementary set of custom-made furniture. The apartment’s striking white palette is most prominent in its entry hall, which also functions as a gallery space that showcases the owner’s art collection. Here, the interior designer selected large slabs of chrome-plated white marble for the flooring, enhancing the clean lines and streamlined look of the interior. A full-length custom-made mirror with an engraved sandblasted frame further expands the sense of space. “We wanted to create a strong first impression, so we inserted Lalique panels combined with Selenite panels on one side, complementing the large mirror made of metal and engraved glass,” shares Coutas. A full-length backlit alabaster door in another hallway leads to the bespoke walk-in wardrobe also makes a grand statement. The prized cabinets take pride of place in the living room, which is a bright, light-filled space decorated with sofas from Minotti and an array of decorative objects. To integrate the owners’ bronze bas-relief pieces into the minimalist setting, the team created bespoke aluminium frames specially for the artworks. A custom-made silk rug from Maison Stark adds to the snug appeal of the room, and a bespoke suspension light from Lasvit creates a glamorous focal point within the space. Suspended from a bespoke mirrored ceiling created for the space is a lighting piece designed by SC Editions featuring 150 glass pieces that appear to float in mid-air. Known for her bespoke approach to interiors, Coutas lavished meticulous attention to detail in every space, including the powder room, which features custom-made pieces designed by SC Editions. It’s decorated with an alabaster-and-chrome mirror, an alabaster sink, sandblasted glass-and-chrome windows, and a breathtaking sculpture comprising a dazzling drizzle of Swarovski crystals. The firm also worked closely with Irish furniture designer Joseph Walsh to create a bespoke dining set. The sculptural dining table seats eight and is paired with a crystal chandelier from Dutch lighting brand Quasar. A Greek sculpture and a set of hand-embroidered artworks from the 16th century add to the elegant mood of the dining space. While the interior designer kept to the monochromatic palette requested by the client, she also injected a few colourful accents to enliven the minimalist interior. Take the kitchen for instance. The sleek space is furnished with white cabinetry and accentuated with lively colours and patterns on the upholstered bench and artworks. Similarly, the master bedroom is punctuated with cobalt blue accents on a decorative sculpture by Arik Levy, and a chair that’s upholstered in a matching Kvadrat fabric. The ensuite bathroom, which is luxuriously decked in Calacatta marble, features an orange Balloon Dog sculpture by Jeff Koons.